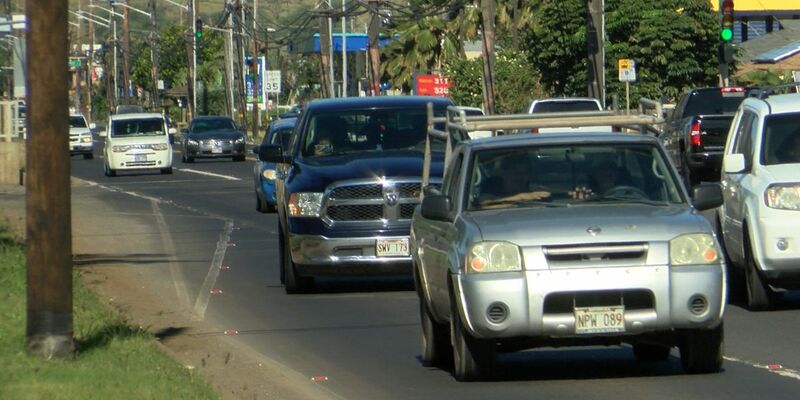 NANAKULI, OAHU (HawaiiNewsNow) - Crews will re-stripe lanes and make other improvements Monday night after a driver complained that poorly painted traffic lines were to blame for a crash over the weekend. Christopher Lai says his car and an SUV struck each other Saturday near the Nanakuli Shopping Center. “If it had been a smaller vehicle like a motorcycle or a moped, you hit those riders and they go down,” Lai said. The collision happened in the townbound lanes of Farrington Highway where, early this year, the state widened the road and added a turning lane through most of Nanakuli. Those two lanes of traffic have to deliberately move over toward the shoulder but the original traffic lines are still visible — and the newly painted lines have faded. Lai said what happened to him was relatively minor. But he said it could’ve been worse. The state Transportation Department agreed, and announced Monday that they’d work to fix the problem. Repair work on the roadway is set for 8 p.m. to 4:30 a.m. Monday. Crews will re-stripe lanes, install marker buttons on lines, install signs and take away old lines. Lai said in the crash over the weekend, he followed the line that he was supposed to follow. The driver next to him, however, kept going straight in the old lane. “He was an out-of-state driver and was not familiar with the road and he just followed the wrong line,” Lai said. Just a short distance from where this happened in the Honolulu-bound direction the lanes look like they were freshly painted just a short time ago. Meanwhile, the Department of Transportation announced Monday that it would perform repairs on the lane striping along Farrington Highway.